Our Cream Cheese And Bacon Stuffed Jalapeno Poppers Are Rich, Creamy And Crazy Delicious. They Make A Perfect Game Day Or Party Snack! Here’s an appetizer that is always a favorite. It’s great hot out of the oven or even at room temperature. The jalapenos have a fairly mild chili flavor when the ribs and seeds are removed. What’s not to love about a cream cheese and bacon filling? I mean seriously! Every time I serve these they’re a huge hit. Give them a try and be ready to give out the recipe. Preheat the oven to 375 degrees. Line a baking sheet with tin foil and coat with cooking spray. Cook the bacon until crisp then drain on a paper towel; chop bacon into very small pieces. Mix the bacon crumbles into the cream cheese until thoroughly combined. Cut jalapenos in half, lengthwise. Wear plastic gloves if possible and carefully remove seeds and vein with a spoon. Smear each jalapeño half with cream cheese and bacon mixture. Pour the panko crumbs onto a plate. Dip the stuffed jalapeño into the panko crumbs cream cheese side down. Bake on a pan with a rack for 20-25 minutes. If the panko crumbs aren't golden brown, turn the oven to broil and cook them, watching carefully so they don't burn, for a few minutes. Serve immediately. Enjoy. They look crazy good. I recall when I moved to Colorado from NC that I would remove jalapeno from anything that it came served with. Now? I can eat them raw almost and love serrano even more in dishes for that 'extra' kick. I need appetizers I can serve at room temperature. You have won me with these. thank you so much for this timely and delicious and WINNING post!!!! 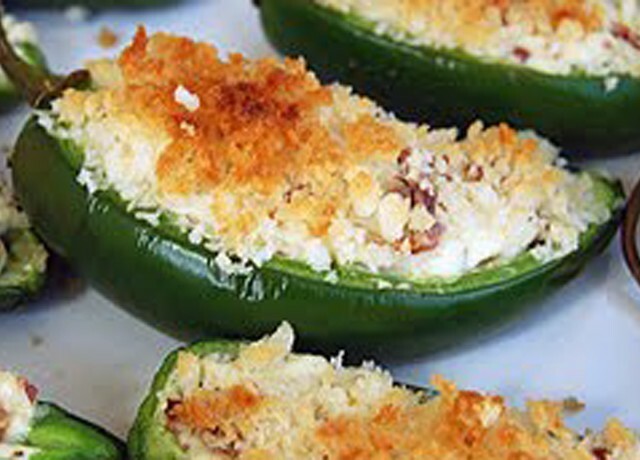 Jalapeno poppers are some of my very favorite treats! Definitely going to try these tasty morsels out. Oh I love jalepeno poppers! These look way healthier than the store bought ones! I will have to try them! I make a version of these that are stuffed with cream cheese and wrapped in bacon (the pioneer woman recipe) but the bacon can be so time consuming to wrap! This looks much simpler, yet just as delicious if not more so! Can't wait to try! YUM- I'd love a few of these to munch on right now. I'm going to make these soon. Would it be wrong to go to the store for ingredients right now and just not share with anyone? Bacon? Did I read bacon? Lead me to it! What a marvelous appetizer. I bet the guys love it too. The other day when you posted this recipe, I saved the link in my “recipes I want to try” folder. I went to the grocery store yesterda and low and behold they had jalapeno peppers on sale, so I picked up 40 of them for appetizers at today's 4th of July get together. Anyway, just wanted to say thanks for the recipe, this is a definite keeper!! awesome! I love how you added the bacon to the stuffing instead of wrapping the popper with bacon! What tasty little treats! Can't go wrong adding bacon! Love this recipe! These peppers look divine! Thanks for sharing! Happy 4th! Wonderful appetizer, my son would really like this. I love jalapenos poppers, but hate how they're usually deep fried when you order them at a restaurant…this recipe is the perfect solution! Hope you and yours have a wonderful Fourth! YUM! Jalapenos and cheese are a great great combination. Definitely making these in the future! I love jalapeño poppers, so I know I'm going to love these. I'm wishing right now that I had thrown some of those onto the smoker, I could use a snack right now and the pork butts won't be ready for another 9 hours. My daughter loves jalapeno poppers so I will definitely need to try these – the addition of bacon must be delicious! Thank you! These look wonderful! I love the addition of Panko crumbs, add nice crunch I'm sure! My motto is that anything with cream cheese and bacon has to be good! These look great, I so want to make them! I'm bookmarking it now, thanks! I love stuffed jalapenos. My friend will be bringing some on Sunday. I myself do not have a recipe for them and will be taking yours. Thanks for sharing. These look great! I love stuffed jalapenos. I hope you have a happy 4th. Thanks! I now know what I'm taking to a party on Sunday. The recipe is printing as I type. I've made similar recipes for this, but I think this one looks the best. Wow! Your poppers look delicious! I have definitely got to try this one of these days. They'd make a perfect appetizer! Perfect for the 4th–all of the flavor without the fry! These are serious appetizers, and just enough of a firecracker perfect for July 4th. These are so powerful and bursting with delicious and awesome flavours. Wishing you a great weekend ? oh how i've missed you blog updates…these look amazing! I bet these would be perfect for the 4th of July holiday! TY for sharing. I will definitely need this recipe. I planted a three jalapeno plants and they are loaded with peppers. These would be gone at a flash in my house.